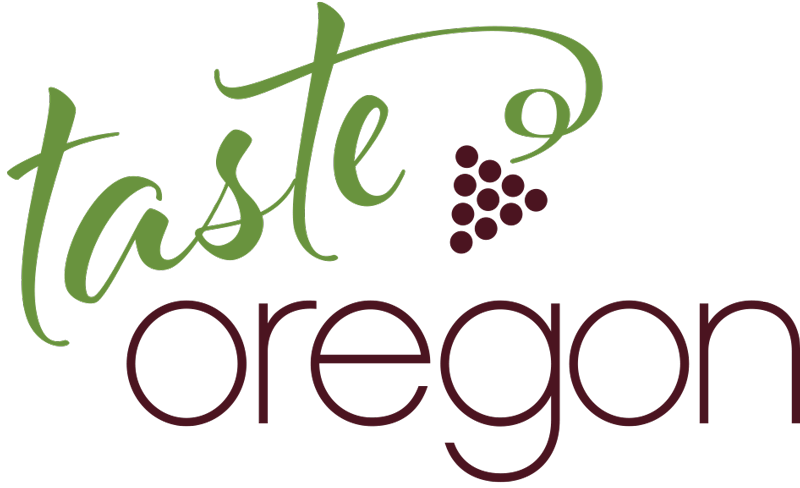 Welcome to the first annual “Taste Oregon” event in Seattle! 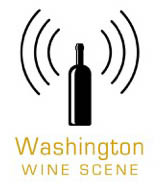 The event will feature 40 premium wineries from Oregon to be held in the SODO area of Seattle at a new venue called the Metropolist. There will be a private trade/industry tasting followed by a general public tasting! Tickets are now available for the general public session by CLICKING HERE! 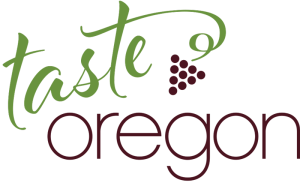 Featuring 40 wines from an array of Oregon’s diverse AVA’s, including: Abiqua Wind Vineyard, Brigadoon Winery, Cana’s Feast Winery, Chateau Lorane, Chehalem, Coeur de Terre Vineyard, Cristom Vineyards, Del Rio Vineyards, Foris Vineyards, Gran Moraine Winery / Siduri Wines, Hyland Estates, J. Scott Cellars, Laurel Ridge Winery, Le Cadeau Vineyard, Left Coast Cellars, Lumos Wine Co/Temperance Hill Vineyard, Mahonia Vineyard, Purple Hands Winery, Quady North Winery, Resonance, Rocky Point Cellars, Schmidt Family Vineyards, Seven of Hearts/Luminous Hills, Sokol Blosser Winery, Solena Estate, Stangeland Winery, The Eyrie Vineyards, The Four Graces (Foley Family Wines), Torii Mor Winery, Van Duzer, Violin Wines, Walnut City Wineworks, Wildaire Cellars, Willamette Valley Vineyards, Whoa Nelly Wines, Youngberg Hill & more to come! Foodtruck on-site is The Hawg’s Trough BBQ! 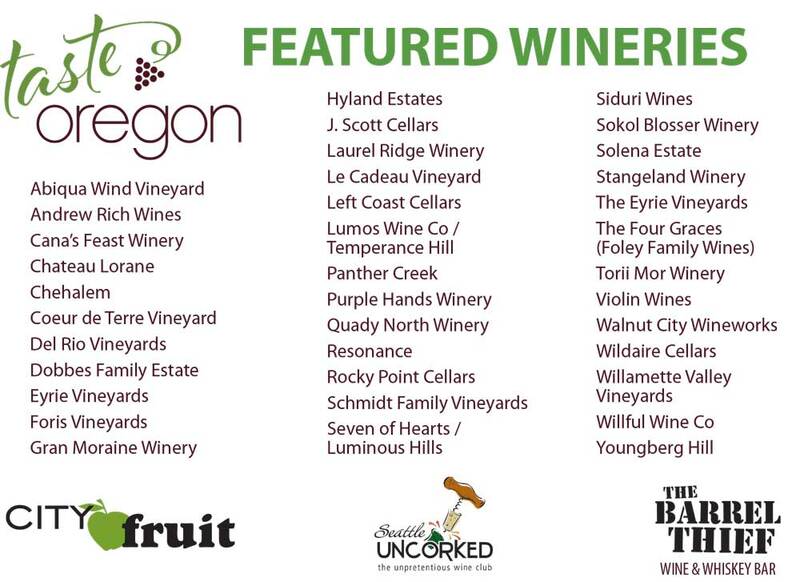 Featuring 40 wines from an array of Oregon’s diverse AVA’s, including: Abiqua Wind Vineyard, Andrew Rich Wines, Cana’s Feast Winery, Chateau Lorane, Chehalem, Coeur de Terre Vineyard, Del Rio Vineyards, Foris Vineyards, Gran Moraine Winery / Siduri Wines, Hyland Estates, J. Scott Cellars, Laurel Ridge Winery, Le Cadeau Vineyard, Left Coast Cellars, Lumos Wine Co/Temperance Hill Vineyard, Purple Hands Winery, Quady North Winery, Resonance, Rocky Point Cellars, Schmidt Family Vineyards, Seven of Hearts/Luminous Hills, Sokol Blosser Winery, Solena Estate, Stangeland Winery, The Eyrie Vineyards, The Four Graces (Foley Family Wines), Torii Mor Winery, Violin Wines, Walnut City, Wineworks, Wildaire Cellars, Willamette Valley Vineyards, Willful Wine Co, Youngberg Hill & more to come! This event is a fundraiser for City Fruit and a collaboration with Seattle Uncorked! Please support our Northwest neighbors in Oregon and help us sell out this cool event by going to this Facebook page and “like” and “share” it to your page! https://www.facebook.com/events/911179468995722/Tickets are now available for the general public session by CLICKING HERE!